CompareTheMeerkat makes sure you’ll never have to overpay for your energy again. The company has come up with a “fantastic digital creation” called AutoSergei, designed to keep life simple and help people keep a robotic eye on their energy bills. 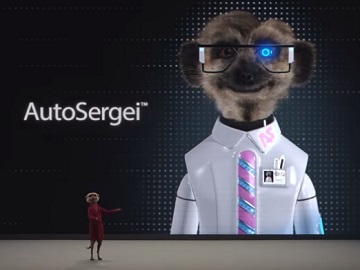 The 30-second spot features Aleksandr Orlov (the meerkat) in front of an audience, introducing AutoSergei, who appears on a huge screen and says he’s here “to simplify your life”. “AutoSergei is just like real Sergei, but without the fleas,” Aleksandr says, making the people burst into laughter. “So relax while he do all the stuff you don’t want to,” the meerkat adds. “Let’s start with energy. If he thinks you’re paying too much…,” he keeps saying, but is interrupted by AutoSergey, who says he just found a better energy deal and asks Aleksandr if he wants to switch. When the latter confirms, the audience starts cheering. The ad concludes with Aleksandr urging viewers to see how AutoSergei could make switching the energy easier and adding the tagline “Comparethemarket. Keep life simple”. Users willing to benefit the services of AutoSergey must set up EnergyCheck in the Meerkat app (which is an easy thing to do, taking only three steps) and let AutoSergei search the market, compare energy prices and inform when they can save. In addition, users can also tap to redeem their 2 for 1 with Meerkat Meals and Meerkat Movies when they buy through Meerkat.